i feel like i need to take a moment to express gratitude to the universe and to you for allowing me to drive the machine behind this creative movement. i am constantly blown away by the art i get to receive & share and the people i get to meet because of it. 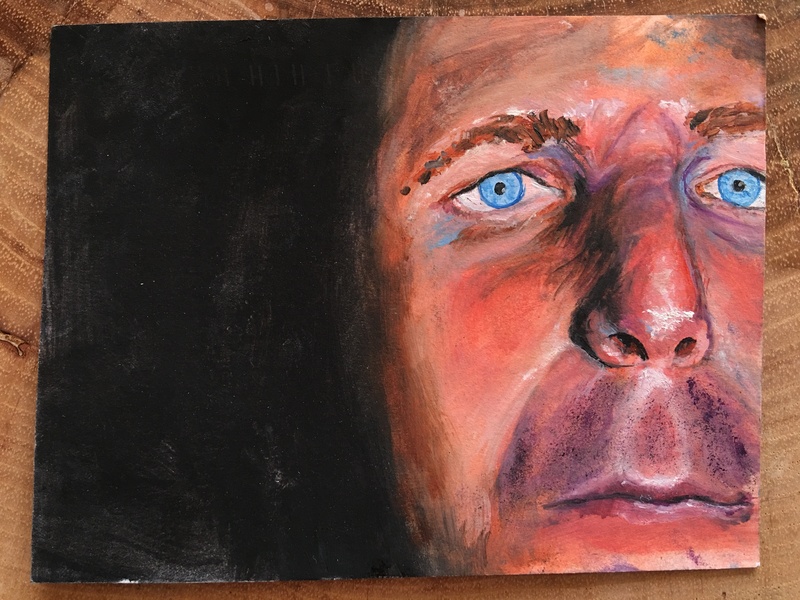 i had the pleasure of picking the brain of mle (emily coleman) after she sent in an amazing portrait postcard (if you need a refresher on what card it is, you can see it here). I was born and raised in Austin, Texas. I’ve lived my entire life in 78704 one block north of Ben White, and I’m pretty proud to be a native Austinite! I was raised in a very creative environment, and being artistic is highly valued in my family. As far as my artistic resume goes I attended UT for studio art for about three years, I’ve worked in an architecture firm, a graphic design company, a bead store, a paint your own pottery studio, and an upholstery shop. I’m currently working part time as a craft cocktail bartender at Whislers, and working part time as a self employed artist. I read that your parents have a very artistic background. In what ways did they/your environment influence your art today? Yes my parents are a gigantic influence on me artistically. I don’t even know where to start. Part of it is that they are both antique dealers so I grew up being dragged to sales and being surrounded by all sorts of really cool visually stimulating items. My dad specializes in ephemera, mainly in postcards but he has a large book and paper collection. My mom focuses in textiles. She’s an amazing seamstress, and makes hand sewn pillows for clients. Over the years she’s amassed an incredible collection of fabrics, laces, trims, buttons… you name it. And it’s all vintage or just plain old. She has a ton of textiles that pre date the civil war and are just incredible. She’s also an interior designer, so she is constantly bringing home beautiful furniture for her clients, and of course sometimes herself. It was (and is) like growing up in a museum. Some local places my mom has helped design are Whislers (where I work coincidentally) and Gardner. My parents used to have a booth at Uncommon Objects when I was a kid, and are now at the antique mall on Burnet if that gives an indication of their aesthetic. Past that though they just understand what it is to be artistic, and to lead an unconventional lifestyle. They’ve always been so supportive of me doing whatever it is that I want to do. Being “successful” in a traditional sense has never been a priority in my family. They began their lives as missionaries, but after feeling that what the church wanted them to do was conflicting with what they felt was right, they left their missionary career of 8 years behind and moved to Austin. The church wanted them to translate a bible into a native american language for a tribe that relied on oral history being passed through elders; in short, to write out a bible for them would have been very disrespectful to this tribe’s traditions and culture so my parents didn’t do it. To have parents who model something like that, that it’s ok to question what your doing and your motives even if it might have scary consequences… I think that’s a very valuable example to have grown up with especially as an artist. My dad has a degree in latin american studies and he also did a lot of linguistic studies of native languages throughout Mexico. He worked for the state for years writing historical markers for cemeteries, and now he’s a barista for Starbucks. My mom briefly attended college for pre-med and did some linguistics work herself though not nearly as much as my dad did. Now she’s a self taught interior designer. In summation they really brought me up to value life as a process, that things change and it’s ok to go wherever it make take you. Again, something that I think is valuable for me as an artist. I’d also like to add that having parents who spent so much time living in Mexico has been a big influence too. I grew up going on trips to Mexico for baptisms, quinceaneras, and just general trips to visit their friends. Both my parents are fluent in spanish, and also speak a little bit of a native american algonquin language. I feel so lucky to have had access to a variety of cultures growing up, and to grow up enjoying a world outside of the US. Who else, what else, how else do you draw your inspiration from? I take a lot of inspiration from nature I think. There’s no better artist than nature after all. There’s an artist named Julie Speed who lives in Marfa that I really enjoy. I’ve met her too, and I just like her as a person. I have a couple of her artist books and I really like everything she writes about as far as her philosophy towards art goes. Other artists I’ve always liked are Ensor, Redon, Edward Gorey, Goya, Fuseli… Those are the ones that come to mind. I personally love so many forms of art and can easily get obsessive about a singular form (photography, cooking, printing, etc) at a time. What is really grabbing you at the moment? I really want to get into wood working more. A lot of times I want to make a piece that’s a very specific size or shape, but when you go to the store it’s all standard sizes of rectangles or squares for the most part. I find myself building custom frames, or going through my parents’ old frames looking to see if they have something old that might work. I did upholstery for a couple of years and did some wood working while attending UT but even so I’m still very rusty as far as building wood structures goes. I’m constantly learning. Along these lines, I’ve been enjoying building custom boxes to house items I find on walks. Mostly seed pods, bones, and cool rocks. I think that’s the hole I’m sucked into at the moment. I love the project that you were (are?) working on creating portraits of the individuals that like your facebook page. How did you come up with that idea? How do you chose who to illustrate? Do you plan to continue to build that library? I am definitely still working on this! Though sometimes it’s a fair amount of time between portraits to be honest. I love doing instillation art, and collage or sculpture etc but there’s a part of me that still wants to feel like if I want to, I can sit down and create a very old school classic portrait. I think that it’s very hard and takes a lot of talent to create a successful likeness of someone, and so I enjoy taking on that challenge. Ergo I started the facebook portraits project to try to hone that skill, and also because I thought it’d be fun for people who had liked my page. When I took figure drawing at UT there were days the model would no show, so we would take turns doing each other’s portraits instead. I always loved to see how other people interpreted how I looked, every portrait was different. Plus again, the challenge of drawing someone was always fun to me. I am doing the portraits in sequential order, from who liked my page first to who liked my page last. Some are great likenesses and some not so much… But that’s the whole point is to get better and better. I also like this project because I use it to try out new mediums. For example right now I’m drying out a scoby from some kombucha to see what it’s like to use as a canvas for a facebook portrait. (I did some research and apparently dried out scoby is similar to leather, some people have made clothes out of it!) I started out thinking I’d do a portrait every week, which turned into every other week… and now it’s honestly one every 2-3 months on average. But I do plan to keep doing it for as long as I can no matter how spread out they get. I appreciate your term “tool box” to describe your different use of mediums and how you use them. Do you have a favorite? I really don’t have a favorite. I’ve read on art blogs that say if you’re too all over the place as an artist it can be a turn off for galleries and curators, so sometimes I wonder if this is a bad thing. The first question I’m always asked when someone finds out I’m an artist is, “What medium do you work in?” When I say that I like all mediums I think most people don’t really know what to do with that. I have yet to have a solo show, and I do wonder what that would look like for me. I think it is definitely possible to have consistency in a body of work when it’s all different mediums. I am trying to figure out what that means for me though. I would agree that I maybe to need to start thinking more about how all my pieces can work together rather than getting sucked into one thing and then another just because I find them all fun. Forgetting to stand back and think of the bigger picture is often a problem for me though. I’m that artist that gets stuck on a detail of a piece and by the time I remember to take a step back I realize I’ve neglected the rest, or the little detail I was working on is in the wrong place and I have to start over. Generally speaking though I really like anything that requires attention to detail. I like making things that surprise the viewer. I get a kick out of miniature things too. So I guess rather than being drawn to a specific medium as a rule, I find myself drawn to particular concepts or characteristics over and over again. How did you get into bones? Taxidermy? This is kind of a long meandering story, so sorry in advance! I worked for about a year at a graphic design agency as a part time art room assistant when I was 18. One of the designers there (now a painter in New York named Michael Berryhill) asked me if I’d want to dog sit for a friend of his. Coincidentally his friend was an art professor at UT named Dan Sutherland. I never took a class with Dan but I think that’s a funny connection… anyways: Dan had a collection of skulls in his house that I really liked. I decided I wanted to collect skulls too. My collection started with skulls I found already clean, and once people find out you collect something they start giving it to you so in that way my collection started to grow. Eventually though I started finding skulls that I didn’t have yet, but they’d still have flesh on them. That lead me to start to learn how to clean and de-flesh just skulls. Fast forward to my years at UT: For my science credits I took geology, and one geology course I took was about mammals in the fossil record. In our labs we would study all sorts of articulated skeletons, and one day my T.A. asked us to be careful with one of the skeletons that was broken. He casually mentioned that he needed to alert the “bone guy” to fix it. My ears perked up. I asked about this bone guy, and it turned out there’s someone at UT who’s job it is to maintain and articulate skeletons. That lead me to research skeleton articulation. I ended up buying some books written by a guy who articulates skeletons for museums ( theboneman.com ), but these books focused mainly on bone building and not on pelts or the skinning process. The last piece of the puzzle fell into place when I started doing upholstery. My mentor in upholstery found out about my interest and he offered to teach me how to skin and gut an animal since he had grown up hunting. He told me to keep my eyes peeled for fresh roadkill, and a week later I brought in an opossum. He taught me the skinning process and I’ve been into taxidermy and bones ever since. I still have that opossum pelt in fact, I hung it on my wall. I’ll add here that I only “recycle” already dead animals. I use roadkill, or animals I find already dead when I go on walks. I have a friend who has chickens in the country… Occasionally he has to shoot something that’s eating his eggs/attacking his chickens and he’ll call me to see if I want it but that’s as close as I get to killing anything. I love it because I regularly get calls from friends telling me if they’ve seen a dead animal, and they always say, “Every time I see roadkill I think of you.” That makes me chuckle. I’m constantly intrigued by the creative process and how it differs from person to person. What does your process look like? My process is very subconscious I think! When I got to this question I really had to think about it. I think my process starts with a seed of some sort. Sometimes the seed is a material I really like, sometimes it’s an idea or emotion I’m feeling very strongly. Then I think I build up around the seed from there. I never know where it’s going to go, it’s a flexible process but I think I usually know what I want the feeling of the piece to be and I just try to make decisions that will foster that feeling. Do you have a space that you work in? I work in a travel trailer from the late 50s. My mom’s parents were missionaries, they traveled all over Mexico in this trailer building clinics or schools or whatever was needed. At some point my mom inherited the trailer. It’s still in my parent’s backyard and that’s where I work out of. Well Austin is where I was born so I love it because it is inherently my home. I have traveled a bit, and I have never been anywhere where I’ve thought, “Ugh I wish I lived here instead.” Even though I’ve been to some great places, I’m always ready to come back to Austin. I love the sun here, the greenbelt, and I love the friendly laid back vibe. I love how liberal it is, and I love how many people live here who I feel like I can have very engaged thoughtful conversations with. How can people find you/contact you? I just signed up for the West Austin Studio Tour, that will be in May. I’m not sure what my studio number is yet as they haven’t been issued, but my studio (my trailer) is located at 4102 Valley View Rd, so that’s where I’ll be! for art inquires or purchase, please contact emily directly. now, go be awesome! *all photos provided by emily coleman.